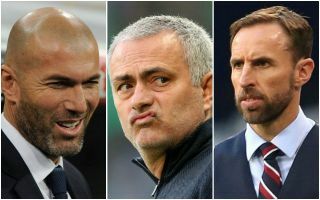 Ladbrokes have kindly been in touch with us to tell us the latest on next Manchester United manager odds as speculation mounts over Jose Mourinho’s future at Old Trafford. The Portuguese seems to be struggling after a poor start to the season, which also followed a difficult summer in the transfer market and some questionable performances in pre-season. CaughtOffside have been told by sources close to Zinedine Zidane that he’s confident he could be offered the chance to replace Mourinho soon, though sources at Old Trafford have largely sounded like they’re backing their current manager. As the rumours go on, Ladbrokes have had a look at some big-name managers and their odds of rocking up at United next, and some solid potential appointments are in there, including a couple of previous Premier League winners in Antonio Conte and Carlo Ancelotti, both formerly of Chelsea. United legends like Paul Scholes and Gary Neville may also be worth an outside bet, though Zidane is priced as the favourite at 7/4.